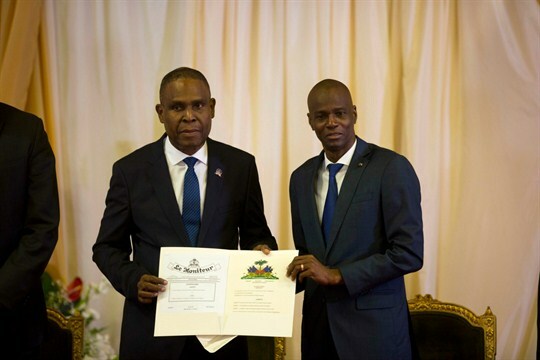 Haiti’s new Prime Minister Jean-Henry Ceant, left, poses for a picture with Haiti’s President Jovenel Moise during his ratification ceremony at the national palace in Port-au-Prince, Haiti, Sept. 17, 2018 (AP photo by Dieu Nalio Chery). Months after deadly riots in Port-au-Prince forced the resignation of Haitian Prime Minister Jack Guy Lafontant, a new government is finally in place. But newly sworn-in Prime Minister Henry Ceant faces a slew of roadblocks, including a major corruption scandal and a yawning budget deficit. Ceant also lacks previous administrative experience and is viewed with suspicion by much of the Haitian political elite. In an email interview with WPR, Francois Pierre-Louis, a former Haitian government official who is now a professor of political science at Queens College, the City University of New York, explains why the new government in Port-au-Prince is ill-equipped to tackle Haiti’s many pressing challenges.